Is recovery after a stroke possible? What is the prognosis for a person that suffers a stroke? Which specialties of doctors treat stroke? A stroke also is called a cerebrovascular accident, CVA, or "brain attack." A stroke is a medical emergency. The affected individual, family, friends, or bystanders need to call 9-1-1 (activate EMS) to access emergency care. From onset of symptoms, there is only a 3 to 4 1/2 hour window to use clot-busting drugs (thrombolytics) to try to restore blood supply to the affected part of the brain. Causes of strokes include ischemia (loss of blood supply) or hemorrhage (bleeding) in the brain occurs. People at risk for stroke include those who have high blood pressure, high cholesterol, diabetes, and those who smoke. People with heart rhythm disturbances, especially atrial fibrillation are also at risk. Stroke is diagnosed by the patient's symptoms, history, and blood and imaging tests. Depending on the situation, including the patient’s neurologic examination and severity of stroke, mechanical thrombectomy to remove a blood clot within a brain artery may occur up to 24 hours after onset of symptoms. This procedure is not available at all hospitals and not appropriate for all stroke patients. You can prevent stroke by quitting smoking, controlling blood pressure, maintaining a healthy weight, eating a healthy diet, and exercising on a regular basis. The prognosis and recovery for a person that has suffered a stroke depends upon the location of the injury to the brain. Confusion, changes in the level of consciousness, trouble speaking, trouble understanding speech, vertigo, and balance problems are other common symptoms. Headache, nausea, and vomiting sometimes accompany a stroke, particularly when the stroke involves bleeding inside the brain. A stroke, also known as a cerebrovascular accident or CVA is when part of the brain loses its blood supply and the part of the body that the blood-deprived brain cells control stops working. This loss of blood supply can be ischemic because of lack of blood flow, or hemorrhagic because of bleeding into brain tissue. A stroke is a medical emergency because strokes can lead to death or permanent disability. There are opportunities to treat ischemic strokes but that treatment needs to be started in the first few hours after the signs of a stroke begin. The patient, family, or bystanders, should call 9-1-1 and activate emergency medical services immediately should a stroke be suspected. A transient ischemic attack (TIA or mini-stroke) describes an ischemic stroke that is short-lived where the symptoms resolve spontaneously. This situation also requires emergency assessment to try to minimize the risk of a future stroke. By definition, a stroke would be classified as a TIA if all symptoms resolved within 24 hours. Not all strokes affect the brain equally, and stroke symptoms and signs depend upon the part of the brain affected. For example, most people’s speech center is located in the left half of the brain so a stroke affecting the left side of the brain would affect speech and comprehension. It also would be associated with weakness of the right side of the body. A right brain stroke would make the left side of the body weak. And depending on where in the brain the injury occurred, the weakness could be the face, arm, leg or a combination of the three. The NIH Stroke Scale tries to score how severe a stroke might be. It also monitors whether the person's stroke is improving or worsening as times passes as the patient is re-examined. Heart conditions like atrial fibrillation, patent foramen ovale, and heart valve disease can also be the potential cause of stroke. When stroke occurs in younger individuals (less than 50 years old), less common risk factors to be considered include illicit drugs, such as cocaine or amphetamines, ruptured aneurysms, and inherited (genetic) predispositions to abnormal blood clotting. An example of a genetic predisposition to stroke occurs in a rare condition called homocystinuria, in which there are excessive levels of the chemical homocystine in the body. Scientists are trying to determine whether the non-hereditary occurrence of high levels of homocystine at any age can predispose to stroke. There may be no warning signs of a stroke until it occurs. It is why high blood pressure (hypertension), one of the risk factors for stroke, is called the silent killer. Some patients may experience transient ischemic attack (TIA) that can be thought of as a stroke that has resolved itself. The symptoms may be mild or dramatic and can mimic a stroke with weakness, numbness, facial droop, and speech difficulties, but these symptoms may only last few minutes. TIAs should not be ignored since they may offer an opportunity to look for potentially reversible or controllable causes of stroke. As well, there is no guarantee that the symptoms of stroke will resolve on their own. For that reason, a TIA should be considered an emergency and medical care should be accessed immediately. Amaurosis fugax describes the temporary loss of vision in one eye that occurs because of an embolus of blood clot or debris to the artery that supplies the eye. While it only involves vision, this situation should be considered a type of TIA. The symptoms of ischemic and hemorrhagic stroke may be the same but patients with hemorrhagic stroke may also complain more of headache and vomiting. A transient ischemic attack (TIA, mini-stroke) is a short-lived stroke that gets better and resolves spontaneously. It is a short-lived episode (less than 24 hours) of temporary impairment of brain function that is caused by a loss of blood supply. A TIA causes a loss of function in the area of the body that is controlled by the portion of the brain affected. The loss of blood supply to the brain is most often caused by a clot that spontaneously forms in a blood vessel within the brain (thrombosis). However, it can also result from a clot that forms elsewhere in the body, dislodges from that location, and travels to lodge in an artery of the brain (emboli). Arterial spasm and, rarely, a bleed into brain tissue are other causes of a TIA. Many people refer to a TIA as a "mini-stroke." Some TIAs develop slowly, while others develop rapidly. By definition, all TIAs resolve within 24 hours. Strokes take longer to resolve than TIAs, and with strokes, complete function may never return and reflect a more permanent and serious problem. Although most TIAs often last only a few minutes, all TIAs should be evaluated with the same urgency as a stroke in an effort to prevent recurrences and/or strokes. TIAs can occur once, multiple times, or precede a permanent stroke. A transient ischemic attack should be considered an emergency because there is no guarantee that the situation will resolve itself and function will return spontaneously without the help of medical intervention. A TIA from a clot in the blood vessel that supplies the retina of the eye can cause temporary visual loss (amaurosis fugax), which is often described as the sensation of a black, dark curtain coming down. A TIA that involves the carotid artery (the largest blood vessel supplying the brain) can produce problems with movement or sensation on one side of the body, which is the side opposite to the actual blockage. An affected patient may experience temporary double vision; dizziness (vertigo); loss of balance; one-sided weakness or complete paralysis of the arm, leg, face or one whole side of the body; or be unable to speak or understand commands. Strokes are usually classified by what mechanism caused the loss of the blood supply, either ischemic or hemorrhagic. A stroke may also be described by what part of the brain was affected (for example, a right temporal stroke) and what part of the body stopped working (stroke affecting the left arm). An ischemic stroke is caused by an artery in the brain being obstructed or blocked, preventing oxygen-rich blood from being delivered to brain cells. The artery can be blocked in a couple of ways. In a thrombotic stroke, an artery can narrow over time because of cholesterol buildup, called plaque. If that plaque ruptures, a clot is formed at the site and prevents blood from passing to brain cells downstream, which are then deprived of oxygen. In an embolic stroke, the artery is blocked because of debris or a clot that travels from the heart or another blood vessel. An embolus or embolism is a clot, a piece of fatty material or other object that travels within the bloodstream that lodges in a blood vessel to cause an obstruction. Blood clots that embolize usually arise from the heart. The most common cause of these blood clots is a heart arrhythmia called atrial fibrillation, where the upper chambers of the heart, the atria, do not beat in an organized rhythm. Instead, the chaotic electrical rhythm causes the atria to jiggle like a bowl of Jell-O. While blood still flows to the ventricles (the heart's lower chambers) to be pumped to the body, some blood along the inner walls of the atrium can form small blood clots. If a clot breaks off, it can travel or embolize to the brain, where it can block blood flow to a part of the brain and cause a stroke. The carotid arteries are two large blood vessels that provide the brain with blood supply. These arteries can narrow, or develop stenosis, with cholesterol plaque that may build up over time. The surface of the plaque is irregular and bits of debris can break off and embolize to the brain to block blood vessels downstream and deprive brain cells of oxygen-rich blood. When a blood vessels leaks and spills blood into brain tissue, those brain cells stop working. The bleeding or hemorrhage is often due to poorly-controlled high blood pressure that weakens the wall of an artery over time. Blood may also leak from an aneurysm, a congenital weakness or ballooning of an artery wall or from an AVM (arteriovenous malformation), a congenital abnormality where an artery and vein connect incorrectly. The bleeding can form a hematoma that directly damages brain cells and may also cause swelling that puts further pressure on surrounding brain tissue. There are four major arteries that supply the brain with blood. The right and left carotid artery are located in the front of the neck and their pulse can be felt with the fingers. The right and left vertebral arteries are encased in bone as they run through the vertebrae in the neck. As the two enter the brain, they join to form the basilar artery. The carotid arteries and the vertebrobasilar arteries join to form the Circle of Willis at the base of the brain and from this circle, arteries branch off to supply the brain with blood. The left side of the brain controls the right side of the body and vice versa. Speech tends to be located in the dominant hemisphere, most often the left brain. The anterior and middle cerebral arteries provide blood supply to the front two-thirds of the brain, including the frontal, parietal, and temporal lobes. These parts of the brain control voluntary body movement, sensation, speech and thought, personality, and behavior. The vertebral and basilar arteries are considered the posterior circulation and supply the occipital lobe where vision is located, the cerebellum that controls coordination and balance, and the brainstem that is responsible for the unconscious brain functions that include blood pressure, breathing, and wakefulness. Strokes may be described based upon the function of the body that is lost and by the area of the brain that is affected. Most commonly in strokes that involve the brain, the symptoms involve either the right or left side of the body. In strokes that affect the brainstem or the spinal cord, symptoms may present on both sides of the body. Strokes may affect motor function or the ability for the body to move. Part of the body may be affected, like the face, a hand, or an arm. An entire side of the body may be affected (for example, the left part of the face, left arm, and left leg). Weakness on one side of the body is called hemiparesis (hemi= half + paresis=weak) and paralysis is hemiplegia (hemi=half +plegia=paralysis). Similarly, sensory function -- the ability to feel -- can affect the face, hand, arm, trunk, or a combination of these. Other symptoms like speech, vision, balance, and coordination help locate the part of the brain that has stopped working and helps the health care professional make the clinical diagnosis of stroke. This is an important concept since not all loss of neurologic function is due to stroke and if the anatomy and physiology do not match the loss of body function, other diagnoses may be considered that can affect both brain and body. A lacunar stroke describes the blockage of a single tiny penetrating artery branch in the brain. 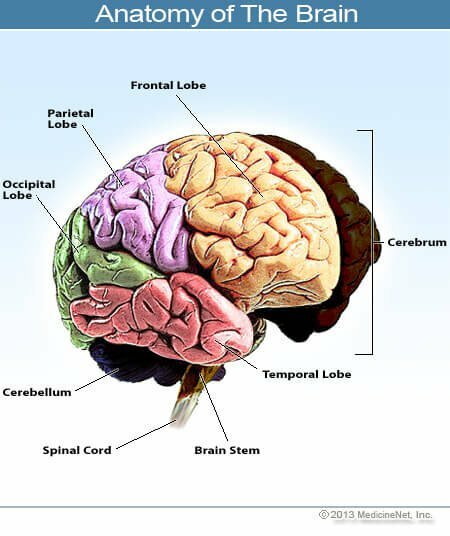 The area of the involved brain is small but can still cause significant neurologic deficits, just like a stroke involving a larger blood vessel and more brain tissue. In some cases, however, the stroke is silent, meaning that no obvious body function is lost and an old lacunar stroke can be seen as an incidental finding on a CT or MRI scan of the head that might be done for other reasons. The term lacune means empty space and a tiny empty space of an old lacunar stroke can be seen on imaging where brain tissue has been lost. 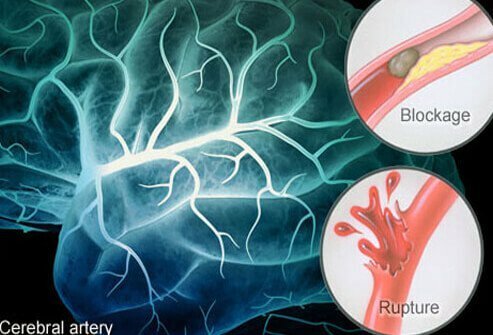 The blockage of an artery in the brain by a clot (thrombosis) is the most common cause of a stroke. The part of the brain that is supplied by the clotted blood vessel is then deprived of blood and oxygen. As a result of the deprived blood and oxygen, the cells of that part of the brain die and the part of the body that it controls stops working. Typically, a cholesterol plaque in one of the brain's small blood vessels ruptures and starts the clotting process. Another type of stroke may occur when a blood clot or a piece of atherosclerotic plaque (cholesterol and calcium deposits on the wall of the inside of the heart or artery) breaks loose, travels through the bloodstream, and lodges in an artery in the brain. When blood flow stops, brain cells do not receive the oxygen and glucose they require to function and a stroke occurs. This type of stroke is referred to as an embolic stroke. For example, a blood clot might originally form in the heart chamber as a result of an irregular heart rhythm, like atrial fibrillation. Usually, these clots remain attached to the inner lining of the heart, but occasionally they can break off, travel through the bloodstream (embolize), block a brain artery, and cause a stroke. An embolism, either plaque or clot, may also originate in a large artery (for example, the carotid artery, a major artery in the neck that supplies blood to the brain) and then travel downstream to clog a small artery within the brain. A cerebral hemorrhage occurs when a blood vessel in the brain ruptures and bleeds into the surrounding brain tissue. A cerebral hemorrhage (bleeding in the brain) causes stroke symptoms by depriving blood and oxygen to parts of the brain in a variety of ways. Blood flow is lost to some cells. Additionally, blood is very irritating and can cause swelling of brain tissue (cerebral edema). Edema and the accumulation of blood from a cerebral hemorrhage increases pressure within the skull and causes further damage by squeezing the brain against the bony skull. This further decreases blood flow to brain tissue and its cells. In a subarachnoid hemorrhage, blood accumulates in the space beneath the arachnoid membrane that lines the brain. The blood originates from an abnormal blood vessel that leaks or ruptures. Often this is from an aneurysm (an abnormal ballooning out of the blood vessel). Subarachnoid hemorrhages usually cause a sudden severe headache, nausea, vomiting, light intolerance, and stiff neck. If not recognized and treated, major neurological consequences, such as coma, and brain death may occur. Another rare cause of stroke is vasculitis, a condition in which the blood vessels become inflamed causing decreased blood flow to parts of the brain. There appears to be a very slight increased occurrence of stroke in people with migraine headache. The mechanism for migraine or vascular headaches includes narrowing of the brain blood vessels. Some migraine headache episodes can even mimic stroke with loss of function of one side of the body or vision or speech problems. Usually, the symptoms resolve as the headache resolves. Time is of the essence since the longer a stroke remains unrecognized and untreated, the longer brain cells are deprived of oxygen-rich blood and the greater number of brain cells that die and cannot be replaced. First responders, EMTs and paramedics may use the Cincinnati Prehospital Stroke Scale to recognize a stroke and alert the emergency department to prepare for their arrival. This scale addresses the same three components as the FAST: speech, arm strength, and speech. In the emergency department, nurses and doctors may use the National Institute of Health Stroke Scale to perform a more in depth and standardized neurologic examination. The clinical diagnosis of stroke is usually made after the health-care professional performs a history and physical examination. While speed is important in making the diagnosis, it is also important to learn about the circumstances that brought the patient to be seen. For example, the patient just started slurring words about an hour ago versus the patient has been slurring his words since last evening. There is urgency to make the diagnosis and determine whether treatment with thrombolytic medications (clot-busting drugs) to “reverse” the stroke is a possibility. The time frame to intervene is narrow and may be as short as 3 to 4 ½ hours after onset of symptoms. For that reason, family members or bystanders may be needed to confirm information, especially if the patient is not fully awake or has a speech deficit. History may include asking about what symptoms are present, when they began, and if they are improving, progressing, or remaining the same. Past medical history will look for stroke risk factors, medications, allergies, and any recent illnesses or surgeries. Medication history is very important, especially when the patient is taking anticoagulants (examples include warfarin [Coumadin], dabigatrin [Pradaxa], rixaroxiban [Xarelto], apixaban [Eliquis], enoxaparin [Lovenox]). Physical examination includes assessing vital signs and patient wakefulness. A neurologic examination is performed, usually using the standardized stroke scale. Heart, lungs, and abdomen are also assessed. If an acute stroke is still a consideration, blood tests and CT of the head are indicated. However, the tests are not used to make the diagnosis, but are used to help plan treatment. Nonetheless, a CT is often used to differentiate an ischemic from a hemorrhagic stroke because the treatment plans are quite different. The CT is used to look for bleeding or masses in the brain and potentially how much brain tissue is experiencing decreased blood supply. A CT perfusion scan may also be done to see how much brain is at risk by using injected dye to check brain blood supply (perfusion). An MRI of the brain may be possibly indicated, but not all hospitals have this technology readily available. Blood tests may include a complete blood count (CBC), to measure red blood cell count and platelets, electrolytes, blood glucose, and kidney function and blood tests to measure blood clotting function, international normalized ratio (INR), prothrombin time (PT) and partial thromboplastin time (PTT). Other blood tests may be indicated based upon the patient's specific situation. An EKG may be performed to check the heart's rate and rhythm. The patient is usually placed on a cardiac monitor. A stroke is a medical emergency and there is now ability to intervene and restore blood supply to the brain of some stroke patients if they present for medical care early enough. As in many emergencies, the first consideration are the CABs (Circulation, Airway, and Breathing, according to the new CPR guidelines) to make certain that the patient has blood pumping, no airway blockage and can breathe and then has adequate blood pressure control. In severe strokes, especially those that involve the brainstem, the brains ability to control breathing, blood pressure, and heart rate may be lost. Patients will have intravenous lines established, oxygen administered, and appropriate blood tests and noncontrast CT scans performed at the same time that the health care professional is performing an assessment to make the clinical diagnosis of stroke and deciding whether thrombolytic therapy (tPA, a clot busting medication) or clot retrieval (mechanically removing the clot through catheters that are threaded into the blocked artery) is an option to treat the stroke. If the diagnosis of ischemic stroke has been made, there is a window of time when thrombolytic therapy using tPA (tissue plasminogen activator) may be an option. tPA dissolves the clot that is blocking an artery in the brain and restores blood supply. For many patients, that time window is 3 hours after the onset of symptoms. In a select group of patients, that period may be extended to 4.5 hours. During that 3-4½ hours, the patient or family needs to recognize the stroke symptoms, get the patient to a hospital (call 9-1-1), have the patient assessed by the health care professional, perform a CT scan to look for other causes of stroke (including hemorrhage or tumor), consult with a neurologist, and stabilize the patient’s blood pressure and breathing. Only then can it be time to administer the tPA or call an interventional radiologist or neurosurgeon to try to remove the clot (mechanical thrombectomy). Hemorrhagic strokes are difficult to treat and a specialist (neurosurgeon) should be consulted immediately to help determine if any treatment options are available to the patient (possibly aneurysm clipping, hematoma evacuation, or other techniques). Treatment for hemorrhagic strokes, in contrast to ischemic strokes, does not use tPA or other thrombolytic agents as these would potentially worsen bleeding and make the symptoms of hemorrhagic stroke worse and potentially cause death. Consequently, it is important to distinguish between a hemorrhagic stroke and an ischemic stroke before treatment begins. Hospital emergency department doctors and nurses are trained to act quickly in caring for stroke patients. The most common delay that prevents tPA from being administered is due to patient delay in seeking medical attention. A CT of the head is done emergently to help distinguish an ischemic from a hemorrhagic stroke. This may also cause a delay in a few instances. Some smaller hospitals may have the ability to virtually consult neurology specialists with telemedicine, who can help make the diagnosis of stroke, review the CT scan, and help decide whether tPA is a reasonable option. The thrombolytic drug may be given and the patient can then be transferred to a better-equipped hospital for further care. The decision to administer tPA in the appropriate patient (there are many reasons that the drug is not indicated even if the patient arrives in time) is one that is discussed with the patient and family, since there is risk of bleeding in the brain with the use of tPA. While there is potential great benefit, because the blood vessels are fragile, there is a 6% risk that an ischemic stroke can turn into a hemorrhagic stroke with bleeding into the brain. This risk is minimized the earlier the drug is given and if the appropriate patient is selected. In certain stroke situations, the treatment period may be extended to 4.5 hours. If tPA is given, the patient will need to be admitted to an intensive care bed for monitoring. As well, depending upon circumstances, the patient may be transferred to a stroke center. Some stroke patients are candidates for mechanical thrombectomy, where a thin catheter is threaded into the blocked artery in the neck or brain, and the clot is sucked out. Depending upon the patient, the size of the stroke, the location of the blockage in the brain and brain function, mechanical thrombectomy may be considered up to 24 hours after onset of symptoms. Mechanical thrombectomy is not available at all hospitals and may not be appropriate for all patients. These procedures require the skill of a specially trained interventional neuroradiologist, neurologist, or neurosurgeon. In those patients where tPA and other interventions are not possible or are not indicated, the patient is usually admitted to the hospital for observation, supportive care, and referral for rehabilitation. Discuss the new 2018 stroke guidelines with your doctor. Prevention is always the best treatment, especially when the illness can be life-threatening or life-altering. Ischemic strokes are most often caused by atherosclerosis, or hardening of the arteries, and carry the same risk factors as heart attacks (myocardial infarction, coronary artery disease) and peripheral vascular disease. These include high blood pressure, high cholesterol, diabetes, and smoking. Stopping smoking and keeping the other three under lifelong control greatly minimizes the risk of ischemic stroke. Patients who have had a transient ischemic attack (TIA) are often prescribed medications to decrease their risk of a subsequent stroke. These include medications to lower blood cholesterol levels and control blood pressure. In addition, antiplatelet medications may be prescribed to make platelets less likely to promote blood clot formation. These include aspirin, clopidogrel (Plavix), and dipyridamole/aspirin (Aggrenox). Patients with a TIA are usually evaluated for carotid stenosis or narrowing of the carotid artery. Surgery to open critically narrowed carotid arteries (termed endarterectomy) may decrease stroke risk. Lifelong control of high blood pressure decreases the risk of hemorrhagic stroke. Atrial fibrillation is the most common cause of embolic stroke. Ideally the heart rhythm can be converted to normal sinus rhythm but in those patients whose hearts are chronically in atrial fibrillation, anticoagulation or “blood thinning” minimizes the risk of blood clot formation in the heart and subsequent embolization and stroke. The drug that is prescribed depends upon the specific patient and their individual situation. Patients who are prescribed apixaban (Eliquis), rivaroxaban (Xarelto), dabigatran (Pradaxa), or warfarin (Coumadin), decrease the chance of a stroke but are at risk for bleeding complications. The ability to intervene in the acute stroke and to try to restore blood supply to brain tissue increases the likelihood that stroke victims can be rescued and brain damage minimized. In patients who have physical, mental, and emotional deficits because of the stroke, rehabilitation offers hope of increased function and return to the level of activity that they had prior to the stroke. Again, the best treatment for stroke is prevention and minimizing risk factors for not only stroke but for heart attack and peripheral vascular disease (PAD). The purpose of rehabilitation is to return the stroke patient to their life and level of function that existed before the stroke. The success of that goal depends upon the underlying health of the patient and severity of the stroke. Rehabilitation may take weeks and months and usually requires a team approach for success. Physical therapists, occupational therapists, and speech pathologists will coordinate care with the primary health care professional and physical medicine and rehabilitation specialists. Some of the treatments are directed to prevent life-threatening complications. For example, speech pathologists may help with swallowing to prevent aspiration pneumonia. Physical therapists may concentrate on strength and balance to prevent falls. Occupational therapists may find ways to allow the patient to perform daily activities from personal hygiene to cooking in the kitchen. Many patients with significant stroke deficits may require admission to a rehabilitation hospital and/or longer term nursing facility prior to returning home. Unfortunately, some patients will have had too severe a stroke to be offered that opportunity. Stroke remains a major killer in the United States and worldwide. In the U.S., 20% of stroke patients will die within a year. However, with the ability to intervene with thrombolytic therapy to reverse the stroke and with more aggressive rehabilitation, the goal is to increase patient survival and function after recovery. Specialized stroke centers, hospitals that have the doctors, equipment, and resources to intervene quickly and treat strokes aggressively, have shown to increase stroke survival and patient function and recovery. These hospitals are certified by The Joint Commission, the American Stroke Association, and the health departments of some states. It is to your advantage to know which hospitals in your area are designated stroke centers because they will have the specialists and equipment needed to minimize diagnosis to treatment times. There are many complications that can develop in stroke patients and some may not be able to return to full employment because of disability. Patients are affected physically with decreased body function, mentally with decreased cognition, and emotionally with depression and anxiety. The return to function depends upon the severity of the stroke, what parts of the brain and body have stopped working, and what complications develop. Patients who lose their ability to swallow may develop aspiration pneumonia when food or saliva is inhaled into the lungs causing infection. Patients who have difficulty moving can develop pressure sores and infection due to skin breakdown. Seizures may be a complication in up to 10% of patients. The more severe the stroke, the more likely that seizures may develop. Stroke care involves many providers as the patient travels through the care process. Care for a stroke patient may begin with prehospital providers (first responders, EMTs, paramedics) who recognize stroke symptoms and activate a stroke response. Emergency physicians begin the evaluation and may help make the decision to administer TPA. Neurologists, neurosurgeons, interventional radiologists may also be involved in the decision to treat the stroke patient with TPA or clot retrieval, if the latter is an option at the hospital. Critical care specialists help stabilize the patient after TPA is given. For patients who are not candidates for TPA, they are often admitted to a hospitalist. Rehabilitation physicians, physical therapists and occupational therapists are involved after the acute event has resolved. Finally, the primary care provider would look after the patient long-term. What type of stroke did you suffer? High blood pressure, defined as a repeatedly elevated blood pressure exceeding 140 over 90 mmHg -- a systolic pressure above 140 with a diastolic pressure above 90. See a picture of Hypertension and learn more about the health topic. Do you love salt? Take the online Salt Quiz to get the facts about dietary salts and sodium in fruits, vegetables, processed foods, snacks and soups!